Rotterdam is undeniably the most futuristic and cutting edge city in The Netherlands. Lonely Planet named The Netherlands’ second-largest city ‘one of Europe’s most exhilarating cities’, and they’re not wrong. Rotterdam is a right metropolis with Europe’s busiest port, groundbreaking museums, fantastic architecture and a multi ethnic community that seeps through in every aspect of the town. Rotterdam is also the only Dutch city with a proper skyline due to the many high rises and bridges. 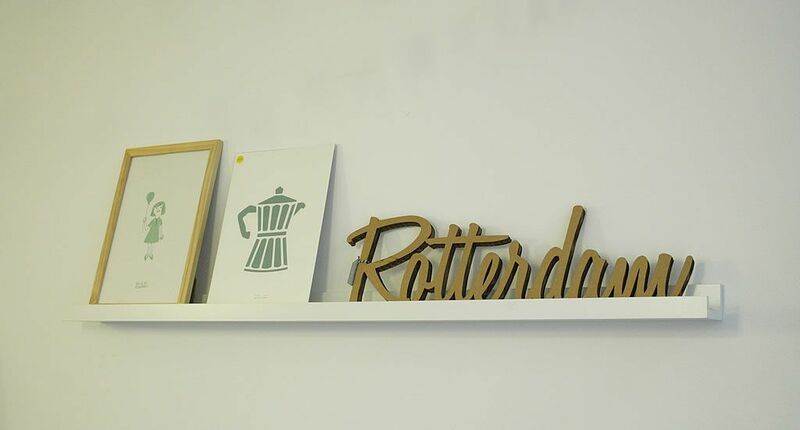 Take at least two days to explore Rotterdam. Rotterdam’s history is inextricably linked to the sea. The first people settled there when a dam was built in the 13th century in the river Rotte. And sea trade started not long after. The city’s famous university owes its name to 15th century Renaissance humanist and social critic Erasmus. 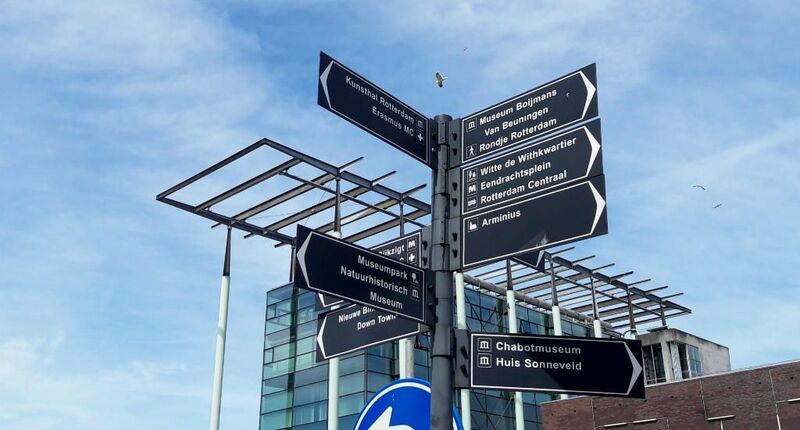 But a big drama caused others to settle their name in Rotterdam, such as the now renowned architects Rem Koolhaas, Piet Blom and Ben van Berkel. After the invasion of Germany in 1940 on May 10th, Hitler pretty much forced The Netherlands to capitulate by bombing Rotterdam and basically destroying the entire city. The only building left from before 1940 is the city hall at Coolsingel. Rotterdam was slowly rebuilt in the 1950’s, but it wasn’t until the 1980’s that the city council developed an architectural policy and the creation of daring new office buildings, apartments and bridges started slowly but steadily, to form the now so famous skyline. You can fly directly to Rotterdam from various airports in Europe, like Londen, Berlin, Barcelona and Vienna. Fares start as low as €20. Find cheap flights to Rotterdam. The airport is only a short ride on the metro away from the city centre, making Rotterdam a perfect destination for European weekend-break. Rotterdam sights and hip neighborhoods are pretty scattered around and you’ll really need to use the trams and metro if you’d like to see it all. If you buy an OV Card you can charge that and use it on all public transport. On RET you can find all timetables and fares. If you don’t have much time you can also consider buying a ticket for the Hop on hop off bus, which will take you to all Rotterdam sights in no time. If you prefer discovering Rotterdam like a local, hop on a bike. The cheapest way is to rent one at the train station. An OV fiets costs €3,85 per 24 hours. If you’re not comfortable riding by yourself, join this bike tour on weekends, as it will take you to all the important sights of Rotterdam and you’ll get to hear lots of interesting background information on the city. Now, Rotterdam is a rather spread out city. So I don’t really recommend exploring it all by food. But that doesn’t mean there aren’t some nice walking tours around. Easy going Rotterdam has several free walks to download. You can walk from port to port, or see the old and new Rotterdam perfectly combined. One of the best museums in The Netherlands and I highly (highly!) recommend a visit. The permanent collection holds the best Dutch art throughout the centuries. From Hieronymus Bosch and Rembrandt to Van Gogh and Appel. The collection of surrealists is also mighty impressive, including works by Magritte and Man Ray. The collection by Salvador Dalí is the largest outside of Spain. The 185-meter high Euromast is probably the most famous landmark of Rotterdam, alongside the Erasmus bridge. You can take the elevator up and enjoy a wonderful 360-degree view of Rotterdam. You can also have a drink and lunch up in the tower. And if you’re very brave you can even try abseiling from Euromast, this will set you back around €60. This bridge has become the symbol of Rotterdam since it was built in 1996. It’s nicknamed The Swan as from afar it looks a little like a large white bird with its wings spread out. From the Erasmus bridge, you can enjoy the wonderful view over water and skyline of Rotterdam, and it’s a short walk from the bridge to Hotel New York or one of the famous Rotterdam museums. Dutch prise winning architect Rem Koolhaas designed this cloud-shaped museum. It showcases Rotterdams’ past and present, with a special emphasis on the 1940-1945 area, which marks the dates of the Second World War in The Netherlands when the city was heavily bombed and almost destroyed. Het Nieuwe Instituut is a brand new Rotterdam museum, after Netherlands Architecture Institute, the Netherlands Institute for Design and Fashion, and e-culture Institute Virtueel Platform decided to merge. The museum looks pretty amazing from the outside, with a moat and a café overlooking a large garden. Inside there are always alternating exhibitions on about design, art, digital culture and fashion. Rotterdam may just be the city with the most interesting architecture in The Netherlands, so taking this guided tour is a real must if you’re an architecture aficionado. 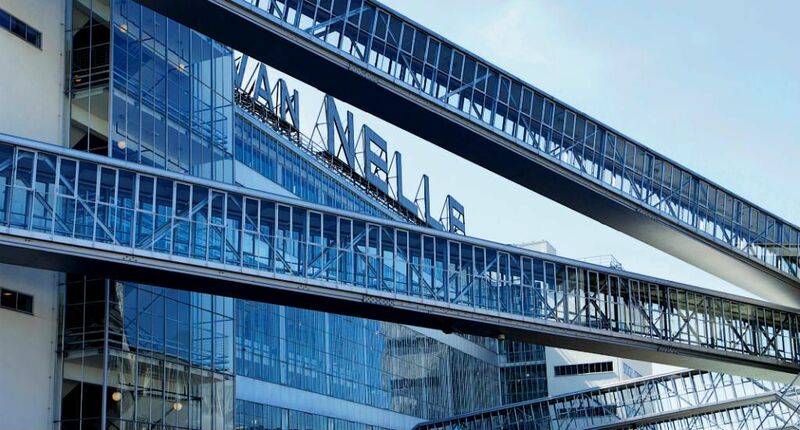 It will lead from the brand new central station to Timmerhuis and Markthal. On the way, you will see a lot of daily Rotterdam life and you’ll find out that basically, every street corner in the city has an interesting story behind it. Witte de With straat is maybe the most popular street in Rotterdam and definitely holds the most hotspots per square meter. If you can drag yourself away from all the nice pubs, restaurants and clubs (though by all means, stay where you are!) hop by the Centre for Contemporary Art, as for some reason this place has a knack for groundbreaking contemporary art and they always have the exhibits just before they become world famous. This is the place to spot upcoming talent. This museum is situated in the old yacht club, and it celebrates multiculturalism in its permanent and temporary exhibits. It provides a glimpse into other cultures and societies and will also provoke some wanderlust. Museum Park is the lush green space that now links six grand Rotterdam museum and it’s a bit of green heaven in this large and bustling city. When museum Kunsthal was rebuilt, architects Rem Koolhaas and Yves Brunier took it upon themselves to completely redesign the park making it a welcome break between museum visits. If you love art, Kunsthal is for you. 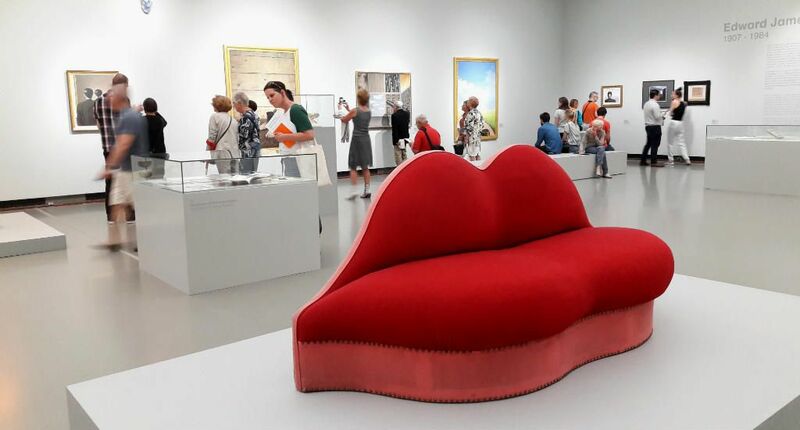 It celebrates art in the widest sense of the word and it’s some of my favourite museums in Rotterdam as they always manage to put on really interesting exhibitions, whether they’re about painting, applied arts or science. I especially appreciate their fashion exhibits. The café is a nice place for coffee or lunch. This amazingly located, and beautiful 19th-century building is not just a hotel or restaurant. It’s an important piece of Dutch history. 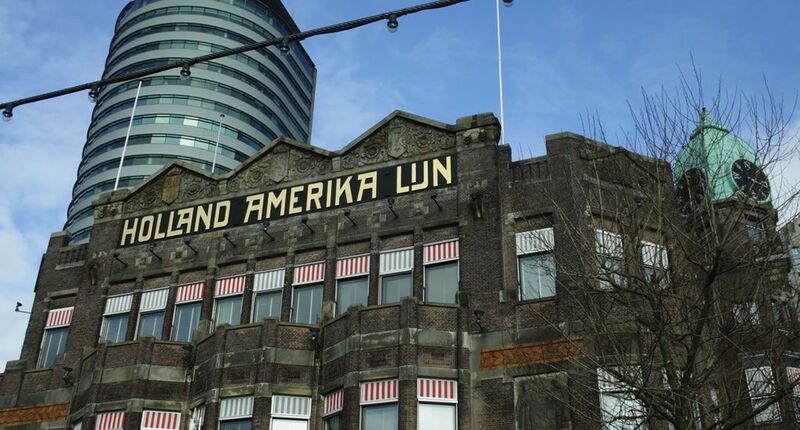 Hotel New York is situated in the old Holland America Line head office and many 19th and 20th century immigrants to the new world took their first steps towards the new world right here. You can have a (really good) bite to eat at Hotel New York, or visit the barber shop or bookshop. 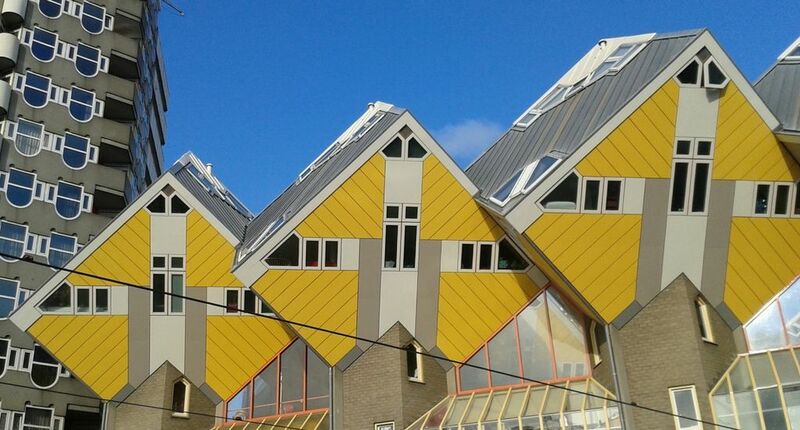 If you take the metro or tram to Blaak you will immediately notice the forest of bright yellow cubic houses (kubus woningen). They were built in the 1980’s by architect Piet Blom and have been the topic of admiration and discussion ever since. You can see one of the buildings from the inside. But you can also stay in one, as one of the largest hostels in town (that also has pretty decent double rooms) is also located in the cubics. The Laurens church is a breath of historical nostalgia amidst all that modern architecture, it’s right next to the newly built modern Markthal. The church was heavily damaged during the 1940 bombings, but it’s now well restored. In summer you should go up the tower for a nice panorama over Rotterdam. Market hall is one of the youngest additions to the long list of interesting Rotterdam architecture. 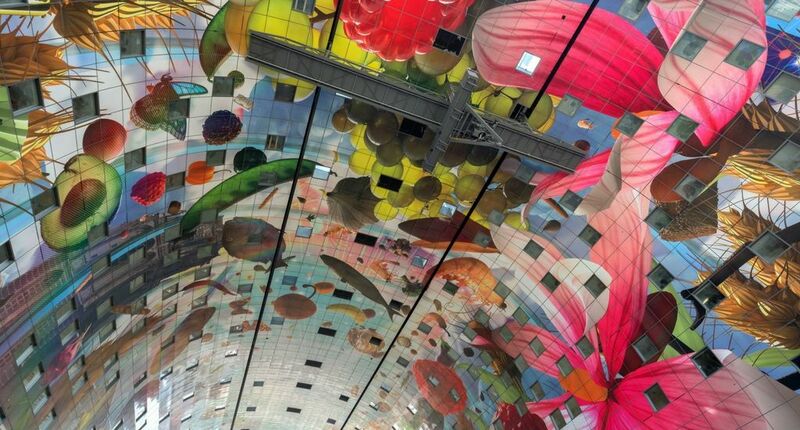 The ceiling of the large covered market is the highlight of the structure, covered in bright illustrations of flora and fauna. Admittedly, the restaurants and cafés are a little bland for me (there are more interesting options nearby), but the building is an absolute must-see. 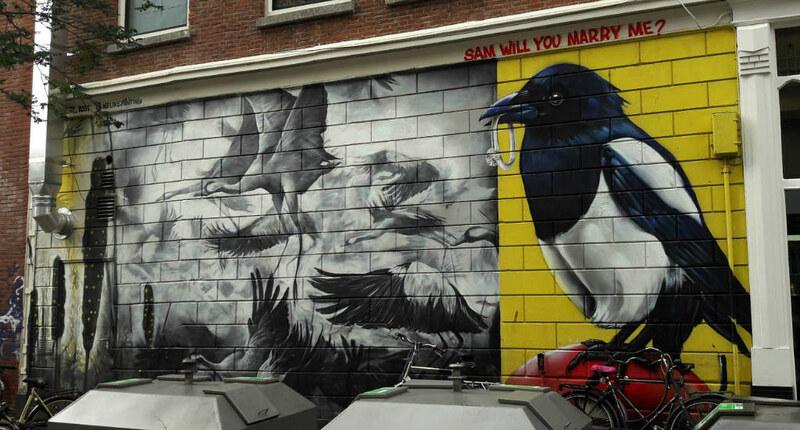 Over the last few years a lot of cutting-edge street art has been popping up all over Rotterdam. 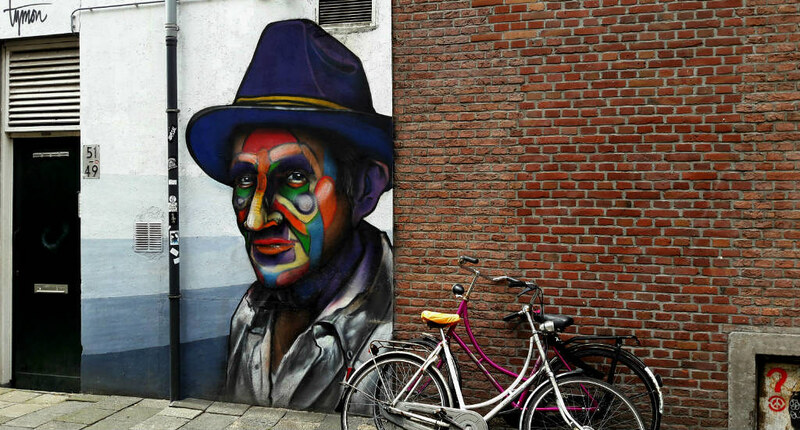 I have noticed some really good murals on and just off Witte the With straat, but there are much more pieces to enjoy. You can download the free app and follow the route yourself, or take a guided street art tour on the weekend. This old tobacco factory, that was built in the 1920’s is called ‘A poem of steel and glass’ and made its way to the UNESCO World Heritage List. I used to go clubbing here with a friend of mine when it had just closed down. Now the factory is completely gentrified and filled with design studios. You can also enjoy a guided tour. For me, this is simply the best Rotterdam has to offer. A couple of years ago you wouldn’t be caught dead in Katendrecht. It was all old wharves and deserted warehouses along some docks. But a couple of local food entrepreneurs decided to buy a warehouse or two for the city council and turn in into food heaven. 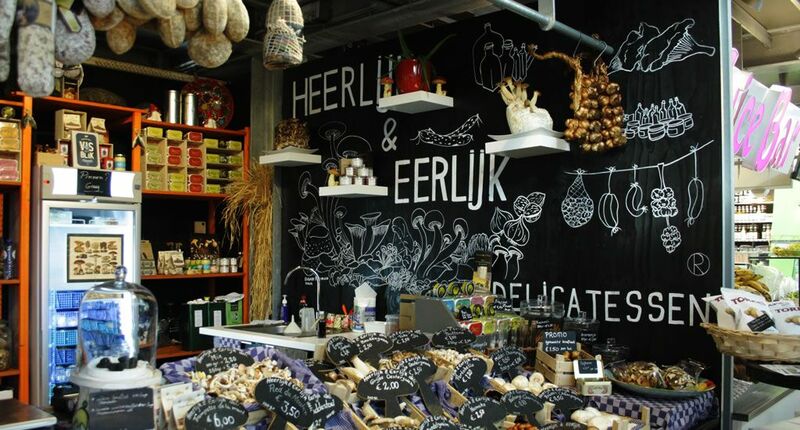 You can visit brewery Kaapse Brouwers here, buy some amazing bread, cheese and meat. But the best part is taking a seat and ordering some of that amazing food and share it with friends at one of the large tables in the hall. If the weather is nice, you don’t want to be stuck in a museum, but still feel like doing something cultural, just walk along Westersingel and take in the amazing sculptures along it. 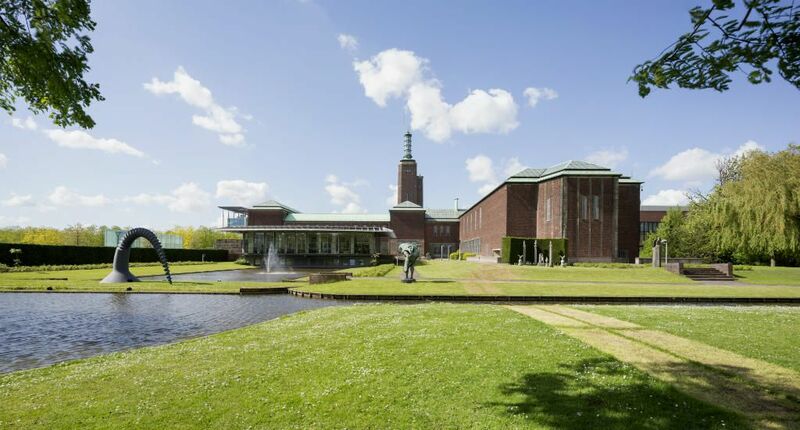 You can see Picassos Sylvette in front of the Boijmans van Beuningen Museum, but Rodins L’Homme qui marche and the sculpture of Erasmus are also pretty breathtaking. Swanmarket was pretty much the first creative design market in The Netherlands, and now organised handmade and design markets all over The Netherlands. But it started all in Rotterdam. Every three months you can still buy handmade design, by young talent, on this market. When Lonely Planet declared to be a big, big fan of Rotterdam it also decided to launch a free mini-guide to Rotterdam. I highly recommend downloading it before your visit to do a little pre-reading. The most important highlights of the city are in the guide and you can also take the self-guided walking tour that’s highlighted in the mini-guide. An absolute Katendrecht delight. 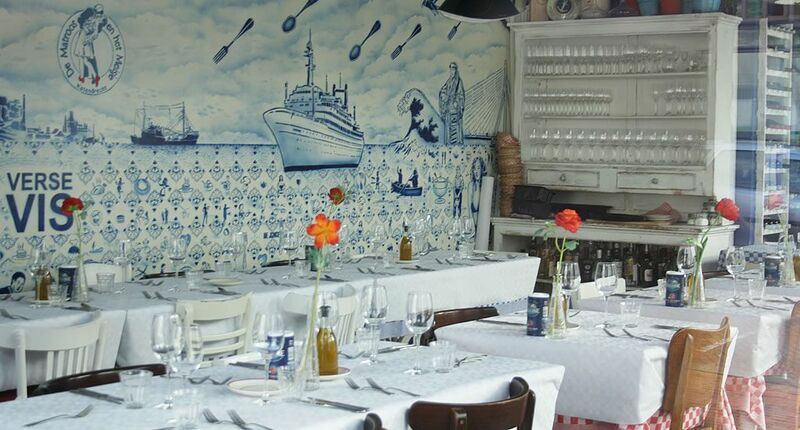 This restaurant, clad in Delftish blue and starched white table cloths offers the very best Dutch cuisine has to offer. But, you eat whatever the chef is preparing that day. It’s a modern, yet cosy, and very popular restaurant. Better book ahead. Once Michelin star-crowned Mario Ridder cooks up a meaty storm in this Katendrecht restaurant, and it will melt the heart of all carnivores. It’s hard to choose between all the amazing patés, burgers, steaks and hams on the menu, and the wine list is rather impressive too. This café is a wonderful excuse to venture to hip hood Het Oude Noorden and go shopping before having tea and cakes. They do amazing sandwiches, scones and tarts. If you want to go for afternoon tea, best book ahead. When walking in you actually walk into the concept store selling fun and new Rotterdam designed accessories. But there is seating upstairs where you can enjoy a nice cup of coffee and some good lunch. Nieuwe Binneweg is one of those long streets in Rotterdam that is great to visit in the evening, wee hours of the night and in the morning, when it’s time for a cup of coffee, some breakfast or some really nice cake. Koekela serves some amazing lemon pie (and other great pies and cheesecakes for that matter). If you’re into Gin & Tonic (I’m not… they make me do weird things), or cocktails in general, head over to Ballroom in Witte de Withstraat. They serve up some amazing cocktails, but it’s also a very nice place for dinner. And the interior design is really cool, too. It doesn’t matter if you want to have drinks or a bite to eat, listen to music, go dancing or explore some more art: you can do it all at NRC Café. This restaurant and shop are located next to Fenix Facory and a good place to have lunch or dinner. You can order some sandwiches, oysters, and sirloin. But while you’re eating, take a good look around, as everything you see is probably also for sale. If you like eating in special setting Gare du Nord is for you, as it’s a restaurant in an old railway carriage. The chefs cook up a storm using only organic produce that’s been grown locally. If the weather is nice, go sit outside: surrounded by all that green the city will seem miles away. It’s a jungle out there! No, really. 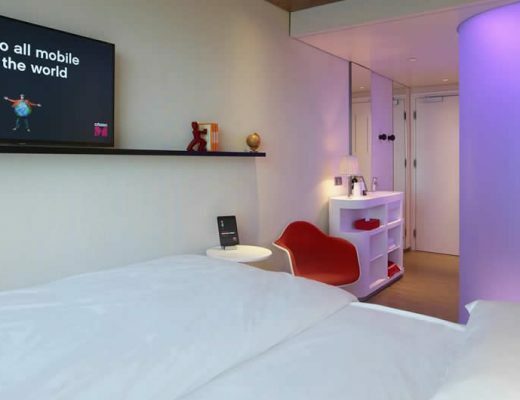 Hotel Bazar on Witte de With straat, is such a fun hotel, with amazingly designed hotel rooms. Every room is styled differently, in middle-eastern design. There’s a nice café and restaurant downstairs with outdoor seating. One of the most fun hotels in Rotterdam at the moment. It’s a hostel, but you can also stay in the beautifully designed double rooms. The location is perfect: on hip and bustling Witte de With straat, near lots of great shops, cafés, and restaurants. The hostel has its own theatre where you can watch Netflix, a good espresso bar and some nice outdoor seating. I am a big fan of this hotel, as it’s brand new, boutique, but also very no-nonsense. The rooms feel very spacious, even though they’re not particularly large. But the clever design will make you smile (you can do everything you want in your room with the provided iPad). You can find a relaxing café and restaurants downstairs. From CitizenM it’s a very short walk to the cutting edge cubic houses and brand new Markthal. Welcome! I am Esther, a 30 something journalist from Utrecht, The Netherlands. I am Your Dutch Guide, here to help you discover The Netherlands beyond Amsterdam.